When John Colville, Churchill’s private secretary, told the prime minister on the morning of Sunday, June 22,1941, that Germany had invaded the Soviet Union, Colville saw him respond with a “smile of satisfaction.” In a special radio address to the nation that evening, Churchill said, “No one has been a more consistent opponent of Communism for the last twenty-five years. I will unsay no word I have spoken about it. But all this fades away before the spectacle which is now unfolding. The past, with its crimes, its follies, its tragedies, flashes away.… The Russian danger is therefore our danger, and the danger of the United States, just as the cause of any Russian fighting for hearth and house is the cause of free men and free peoples in every quarter of the globe.” Churchill then said that Britain would provide all possible military aid to the Soviet Union in its battle against Germany. It was a testament to the desperate situation confronting both nations that Churchill, a champion of democracy, would agree to an alliance with a tyrannical regime at least as bad as that of Nazi Germany. Churchill was swift to back his words with action. The result, at just 96 words, was the Anglo-Soviet Agreement, one of the shortest documents in diplomatic history. 1) The two governments mutually undertake to render each other assistance and support of all kind in the present war against Hitlerite Germany. 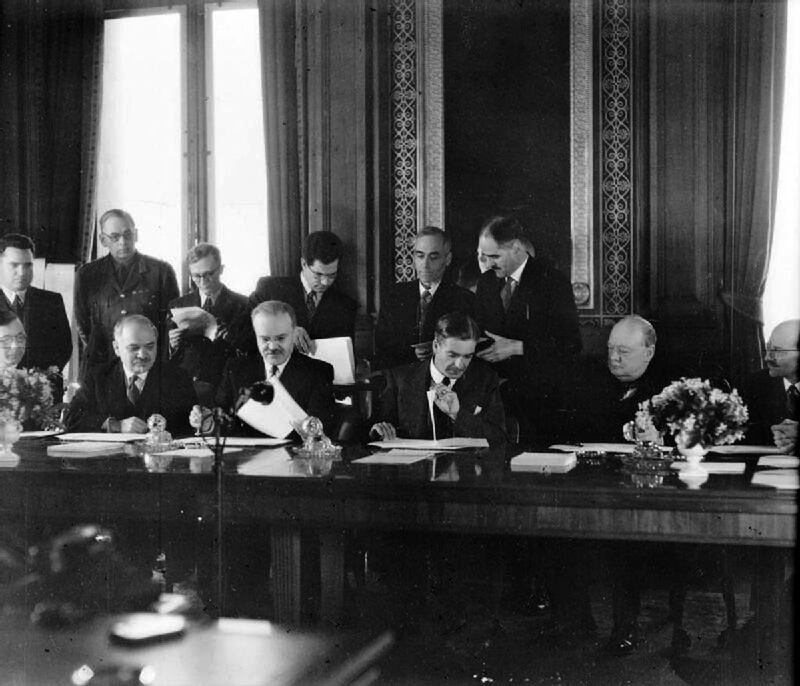 Adding irony upon irony, in a Pathé newsreel of the signing ceremony in Moscow, the narrator noted that the agreement “was possibly signed in the same room” as that of the Molotov-Ribbentrop Pact that helped make World War II possible. A British supply convoy sailed from the naval base at Scapa Flow to Murmansk on Aug. 21, the first of the Arctic convoys. Fine words. And hollow ones. The truth was that even before the wax for the agreement’s official seals had been heated, the first payment of Churchill’s Faustian bargain with Stalin came due. Stalin demanded that Britain recognize the Soviet Union’s western boundary as specified in the Molotov-Ribbentrop Pact, wherein the Soviet Union had absorbed half of Poland. As Germany’s invasion of Poland was the reason Britain went to war, Churchill couldn’t do that. He couldn’t flat out say no, either. Churchill got the issue tabled. Stalin’s demand would return with a vengeance four years later, at Yalta.